Lawrence Sromovsky of the University of Wisconsin-Madison leads a team that used NASA's Hubble Space Telescope to take the first definitive images of a dark spot on Uranus. The elongated feature measures 1,100 miles by 1,900 miles (1,700 kilometers by 3,000 kilometers). 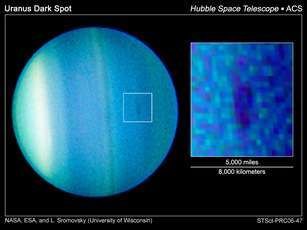 Although rare on Uranus, dark spots have been frequently observed on Neptune. Uranus is similar in size and atmospheric composition to Neptune, but it has not appeared to have as active an atmosphere. Recently, however, Uranus's atmosphere has shown an increase in activity. The development of a dark spot may be a signal of the oncoming uranian northern spring, said researchers. Uranus is approaching its December 2007 equinox, when the Sun will shine directly over the equator. "We have hypothesized that Uranus might become more Neptune-like as it approached its equinox," said team member Heidi B. Hammel of the Space Science Institute in Boulder, Colo. "The sudden appearance of this unusual dark feature suggests we might be right." The dark spot was detected at a latitude of 27 degrees in Uranus's northern hemisphere, which is just now becoming fully exposed to sunlight after many years of being in shadow. Astronomers are keenly interested in how strongly and quickly the atmosphere of Uranus seems to be responding to seasonal sunlight changes. Uranus's rotation axis is tilted almost parallel to its orbital plane, such that the planet appears to be rotating on its side. This sideways orientation leads to extreme seasons during the planet's 84-year path around the Sun. This three-wavelength composite image was taken with Hubble's Advanced Camera for Surveys on August 23, 2006. The research team found the dark spot again on August 24. The inset image shows a magnified view of the spot with enhanced contrast. Uranus's north pole is near the 3 o'clock position in this image. The bright band in the southern hemisphere is at 45 degrees south. From Neptune's blue hue to Jupiter's red spot: are the colours of the planets real?